We all wear masks from time to time. It is a way to protect ourselves, hide our inner most feelings, maneuver difficult situations, and explore new ways of being. Unfortunately, if you aren’t aware of your own mask and the reason you feel a need to wear it, in a certain situation you can lose touch with yourself, your purpose, and path. 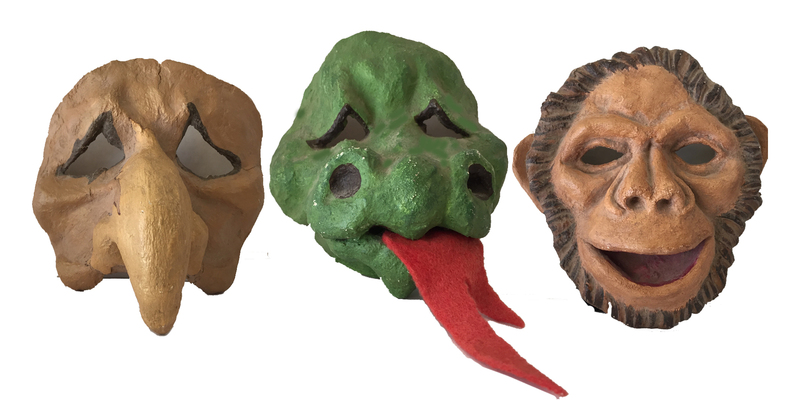 As a street-performing mime in my twenties, I used masks to define my different characters and bring awareness to their body language. During that time, I was always observing and studying how and why people moved. I watched how their movement changed when they were wearing a self-created mask (pretending to be someone they weren’t) and how they moved when they felt the inner freedom to be and express their authentic nature. Over time, I began to see how our body carries our story and how that story can limit our movement, and rob us of our vitality. During this time, I also began to see how movement could restore balance, deepen our sense of self, increase vitality, and allow our authentic nature to reemerge. These observations and my findings are at the root of many of the ICWIB! activities. When you scribble or draw circles and lines, pay attention to how your body moves. Does your body and breath move together as one? Or are they disconnected? If they feel disconnected, which activity helps them to reconnect and move as one? The more you allow your crayon to move in an unencumbered manner, the easier it will be to go inward and reconnect with your authentic nature and what is important to you. With this in mind, I invite you to explore some of the ICWIB! art activities and videos for FREE because they are a wonderful way reduce stress and release bottled up emotions so we can reconnect with our true nature and subsequently create a more joyous life.